When a new Prime Minister or Chief Minister takes charge, their performance is generally not reviewed within 6 months to one year. 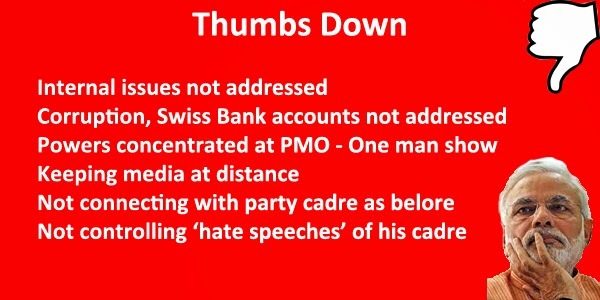 Ironically, in the case of Narendra Modi, the review of his performance started even before he assumed office. Modi’s poll campaign created high expectations among the people, so much so that people expected India’s problems of 65 years, to be solved within a day of his becoming Prime Minister. In the first week of September 2014, Modi completed 100 days in office as the Prime Minister. Almost the entire media reviewed his 100 days’ performance. On behalf of your ezine PreSense, we conducted a quick online/offline survey to assess how people perceived the ‘Modi Sarkar’ at the end of its 100 day rule. Nearly 70% of the respondents gave a rating of over 80% for his vision, governance and communication. So it seems that Modi continues to enjoy the confidence of the people. The respondents were asked to indicate one single achievement of Modi’s governance that they considered outstanding. What stood out were his foreign policy initiatives, that is, the manner in which he got down quickly to build/rebuild relationships with foreign countries. His vision for the nation and commitment to goals, use of technology in governance, his direct communication with the citizens through the social media, and his ‘Make in India’ campaign were considered the great achievements of his first 100 days. Less government and more governance was his motto during the elections and it has now been amplified to effective governance. When we interacted offline with some various groups, including political adversaries of Modi, they hailed his initiatives such as maintaining good relations with foreign countries and marketing India. Many appreciated his focus on increasing the contribution of the manufacturing sector to the GDP, to improve it from 16% to 25%. A senior bureaucrat from Delhi told us on conditions of anonymity that he could see a sea change in the discipline of bureaucrats and other staff members. He said ministers and officials got the uncanny feeling that they were being monitored by an ‘invisible eye’. Another bureaucrat told us in confidence that though Modi’s experiences were drawn from a state administration, he understood the nuances of Central administration well and adapted himself very quickly. He started clearing the stumbling blocks to good governance. “We will be able to see the results of his governance within two years”, he added. The leader of a political party admitted that Modi’s constant contact with the youth through the social media was his ‘master stroke’ that would produce long term gains. A ruling party leader admitted that Modi had a huge back office of social media experts working on analysis of feedback received from the public. Thanks to his communication style, Modi has become an icon among the youth both in India and abroad. He seems to galvanise the positive energies in people, including the youth, towards nation building activities. In our study, we also asked the people about their unfulfilled expectations from Modi, and the issues that needed attention. Many of the respondents were of the view that Modi needed to focus more on the internal issues, such as price rise, power crisis and unemployment. Many of them felt that the initiatives to curb corruption and repatriate black money from the Swiss banks were not visible, as promised during the election campaign. (Incidentally, Modi has set up a high-powered committee to devise ways and means to bring back money, siphoned out of the country by politicians and industrialists. The committee is to submit a report shortly to the government. Also, the Swiss banks have agreed in principle to share information about the source from which they receive funds). One of the professors of a reputed institute confided that Modi should control some of his indiscreet party colleagues, spreading ‘hate messages’ while Modi was emphasising ‘inclusive growth and development’. One of the main criticisms against Modi’s style of governance by his party members was that in the process of improving governance, Modi had distanced himself from the party leaders and cadre. Modi was known for his easy accessibility to all when he was the Chief Minister of Gujarat. In the name of ‘minimum government and maximum governance’, he centralised the authoritative powers at the Prime Minister’s Office. Quoting the recent setback because of the party’s poor performance in the bye-elections, party men feared that continued disconnect with the party cadre could adversely affect their political performance in the long run. During the past ten years, Modi had faced a hostile media. After assuming office as Prime Minister, Modi kept the mainline media away from his tours. He advised his ministers and Members of Parliament to refrain from speaking to the media unnecessarily. The way things look now, Modi intends to focus more on performance than promises. Unlike his predecessors, Modi does not have a high profile media advisor but carried over his PA from Gujarat who doubles up as his media advisor. He reportedly told leading editors in Delhi that he would directly get in touch with them if there was a major newsbreak. Modi’s main mode of public communication is the social media. This style has evoked mixed reactions from the journalists. No doubt, 100 days is too short a period for a fair evaluation of Modi’s governance. Cutting across party lines and age, the survey indicated that Modi has emerged as a ‘strong and dependable leader’ of India, the only one after Indira Gandhi. He has inspired and ignited hope in the hearts of the Indian youth in India and abroad. A senior journalist said that Modi is among those rare leaders in the recent past who inspire confidence in the people. 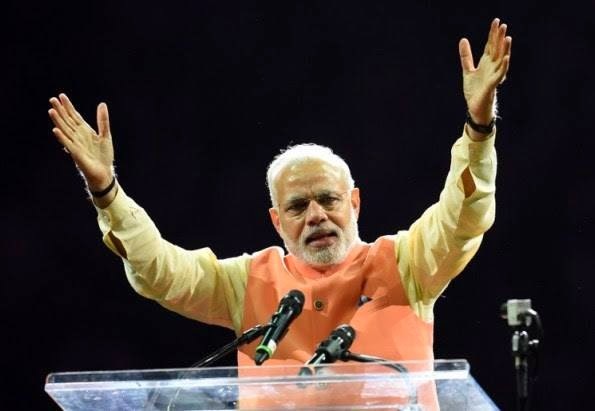 In spite of initial hiccups, Modi has already emerged as a leader of international stature, judging by his address at the 69th session of the UN General Assembly in New York recently. He focused on issues of global importance such as water, sanitation, cleanliness and of course eradication of poverty and the united fight against terrorism caused by fissiparous elements regrouping themselves across the world. Modi told the world from the august podium of the UNGA that he was a leader to watch for, and diplomats have already started comparing him to international leaders like Kennedy and Thatcher, in the manner in which he looks at global issues and addresses them. Modi’s message against groupings, ‘G-8 or G-20 should actually give way to G-all’ emphasised that all nations should come together for a common goal of development instead of a group of rich nations determining the destiny of all. Diplomats have hailed this approach. The industry back home and others in the politico socio cultural milieu claim he is the best bet for India and would lead the nation to greater heights and prosperity. For this, he needs to be given more time and space and a free hand, sans impatient cynicism. Give him the allowance of a couple of years to effect the positive changes he wants to bring to the nation. The process of unwinding from a system of 65 years of bureaucratic cocoon takes time.